Ever wanted to be a pilot? Check out this fun 360 degree panoramic interactive music video (aka flight simulator) directed by Barzolff for Boys Noize, starring WWII Corsair F4 airplanes. Even better than in real life, you can take your time and investigate everything going on all around the plane! Don’t get too nose-y and engaged in the loops during the acrobatic ballet though, as the pilot has a nose of his own worth looking at! Talking about his concept, Barzolff told Mashable: “It’s a sarcastic video about peace and individualism, with the beauty of war for backdrop, the one you fight sky-high alongside your comrades, almost as if in a club with your buddies, showing off your new kicks and latest dance moves.” “Stop” joins the series of 360-degree music videos to use the GoPano Plus camera lens. Find out more about them here. Too curious to see what’s happening to your left when you’re looking right? See the highlights with this multi-screen linear version. Ever wanted to be a pilot? 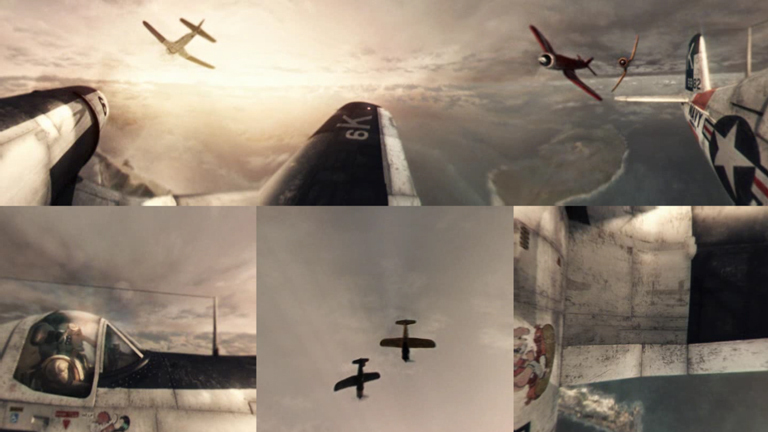 Check out this fun 360 degree panoramic interactive music video (aka flight simulator) directed by Barzolff for Boys Noize, starring WWII Corsair F4 airplanes. Even better than in real life, you can take your time and investigate everything going on all around the plane! Don’t get too nose-y and engaged in the loops during the acrobatic ballet though, as the pilot has a nose of his own worth looking at! “Stop” joins the series of 360-degree music videos to use the GoPano Plus camera lens. Find out more about them here. Too curious to see what’s happening to your left when you’re looking right? See the highlights with this multi-screen linear version.